Hi guys, right now you're looking at a new version of my laser mani. 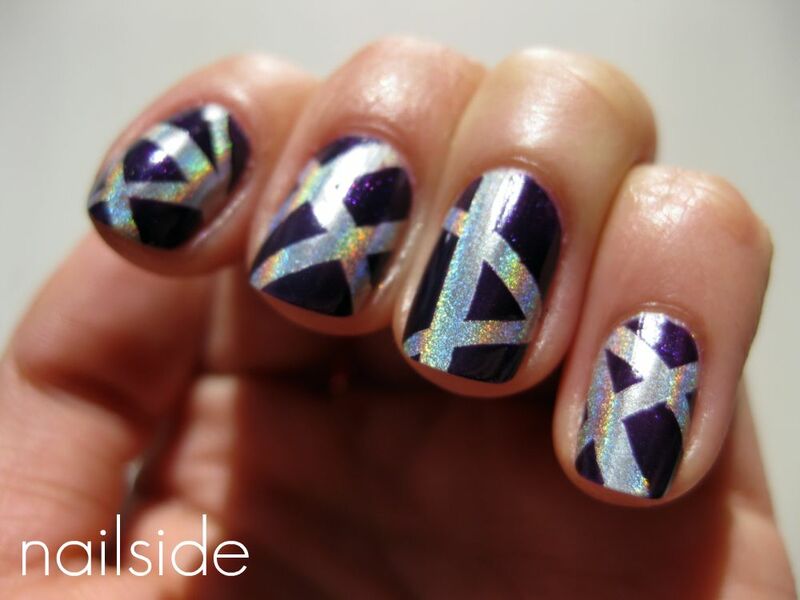 Holographic polishes are just perfect for tape manis. Though they don't always cover in one coat, they sure dry fast. The one I used is Gosh Holographic, it was opaque in two coats and ready to be taped in approximately 5 minutes. On top I used a beautiful purple shimmer from Art de Lautrec, #34 which is a lot less blue in real life. Unfortunately the shimmer isn't visible on the pictures and I didn't use topcoat because that would take away the holographic finish. I'm loving the final look, holographic polishes are such an easy way to make the whole more interesting, so definitely recommended (for tape manis). Stunning mani =) ♥ it!!! Thanks guys! Love your comments. Ooh, I will definitely have to try this! Deze geeft echt een gaaf effect!